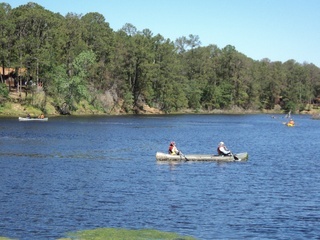 In September 2011, Bastrop State Park and the surrounding pine forest were struck by wildfire that affected 96 percent of the park. However, firefighters were able to save the historic cabins and facilities that were constructed by the Civilian Conservation Corps in the 1930s. The park is recovering from the fire, and most trails, campsites and facilities have reopened to the public.